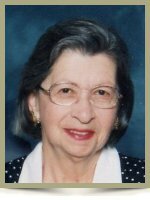 North Grosvenordale – Theresa (Larose) Lajoie, 85, of Main St, died Thursday, June 5, 2014 in Matulaitis Nursing Home. She was the loving wife of the late Philip O. Lajoie for 61 years. Born in Thompson, she was the daughter of the late Adelard and Emma (Dutremble) Larose. Mrs. Lajoie worked as a weaver for Cluett Peabody. She was a housekeeper for St. Joseph Church, Gilman & Valade Funeral Homes and several private homes. She was a long time communicant of St. Joseph Church where she and her husband Philip volunteered countless hours in service to their church. Theresa is survived by her loving and devoted son Raymond P. Lajoie and his wife Danielle of Putnam; her grandchildren Rebecca, Emma, and Matthew; and several nephews and nieces. She was predeceased by her sisters, the late Beatrice Larose, and Doris LaBonte. Relatives and friends are invited to visit with Theresa’s family from 4:00 pm to 7:00 pm on Tuesday June 10, 2014 in the Valade Funeral Home, 23 Main St., N. Grosvenordale CT. A gathering will begin at 9:00 am on Wednesday June 11, 2014, followed by a Mass of Christian Burial at 10:00 am in St. Joseph Church, 20 Main St., N. Grosvenordale. Burial will follow in St. Joseph Cemetery. Memorial donations may be made to St. Joseph Church, P.O. Box 897, North Grosvenordale, CT 06255. For memorial guestbook visit www.GilmanAndValade.com. Your mother was a wonderful lady. Our sympathy to you all. Sorry we will be out of town and unable to attend the funeral. To you on the loss of your wonderful mother. Our sympathy. Sorry to be out of town and unable to attend the funeral. Raymond and family, I am saddened to hear of Theresa’s passing. I am sure that she is reunited with her beloved Philip, and that they are sharing in the just reward of our Lord Jesus, which they both so richly deserve. I am unable to be with you for her funeral, but rest assured that I pray for her and for you as well.